Some farmers call Iowa’s fertile soil “black gold,” but there may be real gold deep under all that dirt. 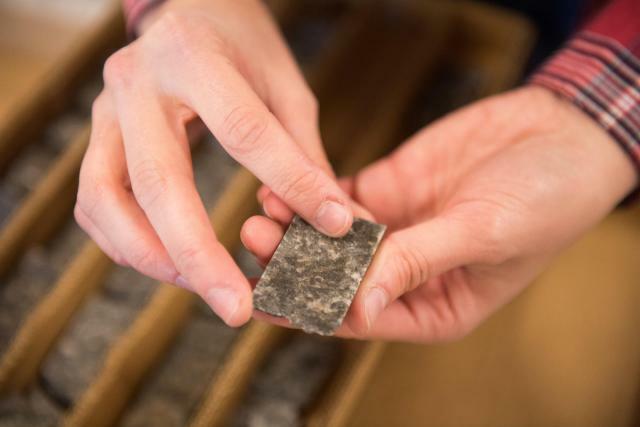 University of Iowa researchers are studying core samples that could unlock secrets to valuable riches more than a thousand feet down. Ryan Clark, a geologist with the Iowa Geological Survey — an agency housed at the UI, says indications show a potentially large formation of minerals well below the surface of ten northeast Iowa counties. The core samples were taken during the 1960s by a company that was prospecting for iron. Geologists are now studying those samples to determine if it’s similar to a massive formation of precious minerals beneath Duluth, Minnesota. If further testing determines there’s a potential great wealth of minerals under a wide section of northeast Iowa, would that eventually lead to strip mining and giant holes in the region’s rolling hills? Some estimates show the giant mineral formation under Duluth is worth more than one-trillion dollars, which is why Iowa geologists are so enthusiastic to explore in northeast Iowa. The ten-county region being studied stretches from Decorah in the north, to Elkader and Manchester in the east, and as far west as Vinton. Don’t go out with a shovel, hunting for gold, either. Clark says the top of the potential mineral formation is at least one-to-two thousand feet down. It’s from the Precambrian era, he says, or about a billion years old.